Select the “Force Monochrome” box on the Dprint touch screen. If you send it to a Colour queue, you can choose either to print in colour or to force a black- and- white printout (for regular Black and White prices) by selecting the “Force Monochrome” box on the touch screen. This entry was posted in Multifunctional devices (MFDs), printers, printing, Uncategorized on January 20, 2015 by libsuggestions. It’s just ironic that although Concordia preaches about sustainability, at Loyola, you still get a ridiculous printout receipt for filling up your copy card. Makes sense? Do you really think anyone treasures the fact that they added two bucks to their card, and needs to commemorate it in print? It’s an unbelievable waste of paper, ink and expense, and the conveniently placed garbage can under the machine just encourages people to throw out the paper- so much for recycling. If there is this additional money to just throw away on useless receipts, I would much rather it be spent making sure the printers actually work (when I came to the library yesterday, two of the printers were already ‘temporarily’ out of order. As a student who has pumped in much money to this school, we deserve much better than this. This is absolutely ridiculous, especially at this time of year when we Need things to reliably work), full of paper, and more routinely checked and maintained. if you have the money, spend it on maintain the printers during the evenings- to tell students, “sorry, guess you’ll have to just print and hand out your assignments during our working hours” when as students, we’re here at all hours of the day, is insulting, unfair, and a very lame excuse. The reason that the DPrint loader at the Vanier Library automatically prints receipts, is to prevent a noisy beeping sound. The loader can be set up to not print receipts as a default, but it requires input from the patron on whether or not to print a receipt. To alert the patron that input is needed, the loader beeps incessantly. This was disturbing to students and staff so it was changed it to print without waiting for input and without beeping. The Vanier Library has been in contact with Dprint regarding the maintenance and paper loading for the printers in the library. Approximately two weeks ago, Dprint changed the servicing frequency and time for the Vanier Library printers. We hope this will address the concerns of the library community. Contact the DPrint team at dprint@concordia.ca. If you are experiencing problems using the DPrint self-serve devices on campus or have questions regarding our services do not hesitate to contact us. This entry was posted in Multifunctional devices (MFDs), printers, printing on December 15, 2014 by libsuggestions. 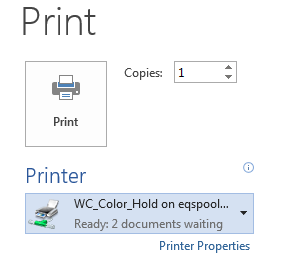 I have been working at a computer for a while now, regularly sending things to print, when I suddenly realized that the automatic printer option is the COLOR printer!! How did this happen?! This means that NONE of my things will print. this is ridiculous- please make sure the black and white is the default one- what a loss of time! Now I have to retrace my steps on everything… this is so stupid… and completely avoidable. We are looking into this ongoing issue with the default printers at Vanier Library, in the meantime, there are steps you can take to ensure that you get your print jobs. 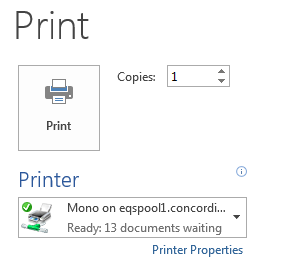 You can verify the default printer on your particular workstation by using the printer drop down menu and change from Colour to Black and White (Mono), or vice versa. This entry was posted in Multifunctional devices (MFDs), printers, printing on November 5, 2014 by libsuggestions. I’m working at Loyola (on a Friday in the evening), and one of the three printers has been jammed since yesterday, and the single fill-up machine on campus is also broken. This is absolutely incredible- so long as our funds are allocated towards ‘prettying up’ the website, the printing services are still incredibly lacking. I would bet money that if I complained to a librarian about this, I would be told, “don’t worry dear, someone will come fix it on Monday”. Monday?!? If we as students are here working on the weekend, we DESERVE functioning and MAINTAINED machines and services. This is absolutely inexcusable and infuriating. Another issue is that the security officer I mentioned the useless machine to, spoke no English. G-d forbid there should be any issues, he would not understand anything. Glad our priorities are straight. Sarcasm aside, we would REALLY appreciate if you took students’ concerns into account-considering how much time (and money) we put into this, that’s the least we deserve. I’m sorry to hear that you had a bad experience, I can understand your frustration. However, the DPrint machines and loaders do not belong to the Libraries. They fall under the jurisdiction of Concordia Retail (the Bookstore). Your comments have been forwarded to Concordia’s DPrint service and the loader at Vanier library has been repaired. We have also notified the appropriate people in the Security Department and passed on your comments. This entry was posted in Multifunctional devices (MFDs), printers, printing, safety and security, Uncategorized on September 17, 2014 by libsuggestions. I was working at Loyola’s library, and was pleasantly surprised to see that they have a stapler AND hole puncher available afterhours- As It Should Be. It never ceases to frustrate me and others at the downtown library as to why the stapler is taken in when the librarians finish for the day. As students, we’re here at all hours, and having a functioning and reliable stapler should be the least of our worries and something that is guaranteed- heavens knows we pay enough fees. Surely a stapler ought to be included in them. It’s just infuriating and ludicrous the logic- ‘oh, we have to take them in or someone will steal them- do you know how many we’ve had to replace?’ is the lame excuse I’ve heard so many times. Why don’t you just chain it to the table if there is this concern? But to leave us with nothing… that makes no sense. It seems to work fine at Loyola- why can’t we also have it downtown? Thank you for your comment. I can understand your frustration. Unfortunately, in the past, we’ve had many staplers broken and stolen from the Webster library, some were chained to the desk and some were not. Library management will consider making a secured stapler available. This is also a good time to remind our library users that the DPrint/MFD machines have stapling capabilities for both newly printed pages and photocopies. Q: Will the printer-copiers automatically staple my documents? A: By default print-outs and photocopies are not are not stapled, but you can request that the print-outs be stapled. Printing: Before you send the print job, go to the print dialogue box and click on ‘preferences’. On the right side of the box there is a ‘stapling’ drop-down menu. Choose 1 or 2 staples. This entry was posted in Multifunctional devices (MFDs), printers, printing, stapler, Uncategorized on August 4, 2014 by libsuggestions. doesn’t act up this time. It’s a huge time waster. Hopefully I am reporting this to the right place. Thanks! In this type of instance, it is typically that the student does not have enough money in their account to print the job. Unfortunately, the device does not say ‘Insufficient Funds’ when the student tries to print. The only way for them to know is by doing the calculation themselves and noting their account balance in the top right hand corner. If the student does have funds, it could be that the document they are trying to print is not a standard paper size (i.e. they are trying to print in the A4 format, which the device does not have). In this case, the student needs to change their document size at the computer. Unfortunately, there is no warning on the device if this happens. This entry was posted in Multifunctional devices (MFDs), printing on April 8, 2014 by libsuggestions.